foot-hold traps are not legal. Hunters and trappers use foot snares almost exclusively. A bear cage trap is a big, expensive, metal culvert-type affair that has to be moved by vehicle, while a foot snare can be easily carried in one hand and costs about $50, and can be re-used indefinitely. The choice is a no-brainer for most. The foot snare is very humane, and does not damage the bear’s foot. The International Organization for Standardization (ISO), founded in 1947, is a highly respected organization with 164 member nations, and is the reference group for manufacturers globally. Using injury scores developed by veterinarians, in cooperation with animal welfare groups and wildlife biologists from many countries, ISO tested foot snares extensively. In the 1997 Agreement on International Humane Trapping Standards (AIHTS), ISO certified the foot snare as humane and acceptable for capturing animals without injury. The foot snare uses a spring and trigger assembly to close a loop of 3/16-inch diameter smooth steel cable on a bear’s foot. The trigger is placed where a bear will step on it, and a 12-inch diameter loop of cable is laid on the ground around it. When the bear steps into the loop and onto the trigger, the spring is released, lifting the loop and closing it on the bear’s foot. A sliding one-way lock mechanism lets the loop close, but not open. A metal stop keeps the loop from closing tighter than 21⁄2 inches. This lets any cub bears, coyotes, raccoons, etc., escape. The end of the cable opposite the loop is wrapped around a tree, and held in place by cable clamps. It is attached tightly enough so the bear can’t slide it up the tree by climbing, potentially hurting itself, but loose enough so it can rotate freely around the tree without twisting. Several heavy duty swivels in the cable prevent the bear from twisting it, and possibly injuring itself. The bear can only go round and round the tree. Essentially, it’s on a leash. 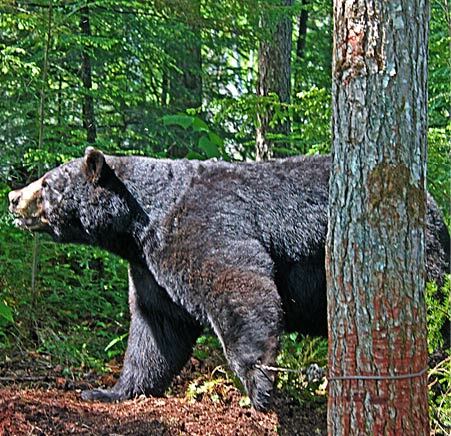 Maine’s nationally famous Bear Study has monitored thousands of bears since it started in 1975. During that time, using the foot snare, it has trapped and released, unharmed, for research, over 2,700 bears. Many bears have been caught repeatedly through the years, and have shown no physical or behavioral trauma from the experience. Trapped bears don’t struggle much, and are found sitting quietly at the trap site, often sleeping. Their health and condition is closely studied and examined by trained biologists, and trap injuries are statistically non-existent. The bears have to be released completely unharmed for the studies to be effective. Foot snares would never be used if they damaged the animals even slightly. The foot snares the Bear Study program uses are exactly the same traps used by recreational bear trappers. They do not cause pain or injury to the bear.